FordAnd it gets 20 mpg! Ford’s 2018 Expedition achieved a government-rated combined city-highway level of 20 miles per gallon. That’s better than any other full-size SUV in the class. The number vindicates Ford’s lightweighting strategy for pickups and SUV and proves that consumers will accept smaller engines. When it comes to full-size SUVs, fuel-economy isn’t always top of mind for consumers. Seating capacity, cargo room, towing, and old-school power rank higher. But good mpgs are always a welcome extra, and Ford is setting a new standard for the rear-wheel-drive version of its new 2018 Ford Expedition. “It has an EPA-estimated rating of 17 mpg city, 24 mpg highway, and 20 mpg combined,” Ford said in a statement touting the numbers. The automaker cites the SUV’s aluminium construction, engine design and 10-speed automatic transmission for the achievement. 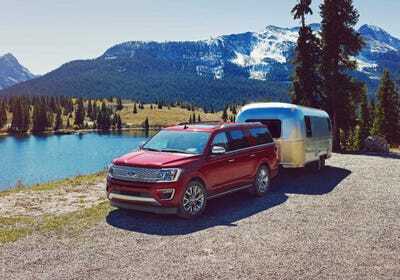 The Expedition’s 20 mpg combined rating is just a bit better than the competition, notably the Chevy Suburban’s 19 mpg combined. The boost in fuel economy can be chalked up to a pair of big risks that Ford took with its pickups and SUVs in 2014-16. First, turning to lightweight aluminium construction threatened consumer blowback and could have complicated the vehicle assembly process. But neither outcome came to pass. Second, the introduction of race-proven, six-cylinder turbocharged engines could have alienated diehard V8 fans. But thus far owners have appreciated the improved fuel-economy with no loss of power or towing capacity.